How Far is Sree Daksha Vhridhaa Villa? Sree Daksha's Vhridhaa is a villa project spread across 15 acres of Land, set in the foot hills of Marudha Malai. There is a apartment complex in the same premises. 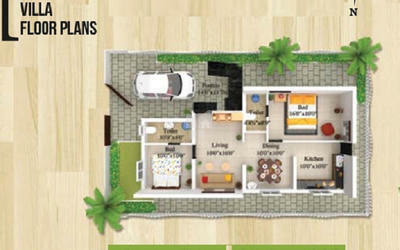 Vhridhaa is located in Vadavalli, the most preferred residential area in the city of Coimbatore. Tucked away from the hustle and bustle of city life, Vadavalli is close enough to be right where the action is, if you so prefer. Framed by the rolling hills in the horizon, there is greenery all around. The air is good to breathe and the water sweet to drink. There can’t be a better place than Vadavalli to come and settle down. You can have the best of both worlds – the sheer excitement of city life and the calm, soothing environment of hills, tall trees and grasslands. ENTRANCE DOOR: Standard wood frame, membrane pressed panelled shutters, brass hardware with polished finish. TOILET DOORS: Standard wood frame. membrane pressed paneled shutters with water proofing treatment. ALL OTHER DOORS: Standard wood frame, membrane pressed panelled shutters with Polished finish, brass hardware with mortise lock. INTERNAL WALLS: Internal walls with two coats of putty and one coat of white water based primer & two coats of emulsion painting. We are one of Coimbatore’s leading-edge property developers. For the last 15 years, the company has grown with good vision into reality. Today the company’s name has its own quality Construction business in the city. We are committed to design, develop, construct Residential, Commercial complexes and all types of Buildings, We are able to work closely with the customer from the planning stage through occupancy, assuring the customers’ needs are Fulfilled with pleasance. A number of construction projects followed and the Group acquired an enviable reputation for the quality of work, timely completion, affordable prices and total customer satisfaction. We sincerely work to hold to the basic principles that have been instilled since the inception. Honesty, commitment, quality, service and value are key components that the company works to attain on every project. We will further work hard to enhance the interest of our partners, employees, suppliers & society. The company has since developed several communities. It is our goal to ensure your complete satisfaction throughout the building period and long after. We offer innovative floor plans with a variety of flexible options to meet your changing lifestyle needs. Beyond brick and mortar, steel and glass what makes a house a home is people. That is why we look towards building relationships which last. Made possible by the fact that every home opens up enormous possibilities to build relationships. For the past decade or so, we have brought contentment and happiness into the lives of hundreds of families who today constitute the larger Daksha family. They stand testimony to our commitment and it is they who give us the confidence to strive ahead in our quest for excellence.